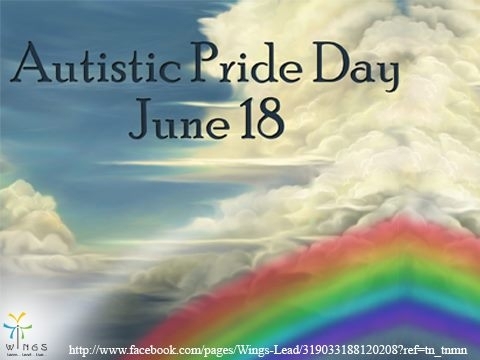 I had no idea today was Autistic Pride Day, but this is our FIRST one, and I am sure there will be plenty of other first events and learning experiences along Our journey. Although I don’t need a reason to share Our experiences, a day like today provides extra incentive to share part of Our life with the world. We show Autistic Pride in almost all that we do, but I think the most important way is being honest and open about Our life with everyone. We do not live in fear of saying the “wrong” thing or not being politically-correct, because we are NOT trying to influence anyone else, we are simply sharing Our thoughts, feelings, and experiences in relation to Our family’s Autistic journey and what works for us. We feel that one of the most important parts of being honest is not trying to paint everything as rainbows and sunshine. We have more than our share of storms and darkness, but we refuse to let it keep us down. Please notice I said “Keep us down” because there are times that it is just too overwhelming and we do get down, but eventually we pick ourselves up and push forward because that is what our children need us to do. As my best friend told me when Beth was first diagnosed: “I know your upset and I know you are sad, but it’s not about you. You need to stop wallowing and get yourself in gear, because this is about Beth. What are you going to do to help your daughter?” Marie can always put things in perspective for me and inspire me to be a better person. I thank God every day for her presence in Our life. There are days when it is good and I cannot stop thinking how smart, adorable and amazing my children are. Then there are days when it is bad and I wonder how they can be so cute one moment and so beastly the next. I honestly have to remind myself that they are not plotting against me and they are just young children, special needs or not. Then there are the days when it is horrendous, and all I can do is pray, because I am convinced that God has trusted me with a job that is too immense and important for me to handle. On those days I feel like I am not only failing as a mother, but as a human being as well. Those are the days when my Al-Anon program comes into play the most. Those are the days when I work my program as if my life depended on it, because in a way it does. Our children are our life, and if I fall short in my job as a mother, then I am damaging my life. This is why I fight to be positive and see the light in all situations. This is why I attempt to use my flaws and regretful moments to teach myself and our children that we are all human and make mistakes, but it is how we take responsibility for our actions that defines us. I show them that we all fall, but we must get back up and find the opportunity for growth. We must focus on the positive and face every situation with Faith, Love and Acceptance, so that we can be proud of ourselves and show the world bad things happen, but you can turn the bad into something amazing and beautiful. I remind all of us, that Our continued progress is more important than perfection. We persevere through love and hope, because we know we are not alone, we always have each other and God to walk beside us. Our family may not always be in sync, but at the end of the day we are together and grateful for another day filled with the kind of crazy, loud, busy, peaceful, loving, joy that makes Our path so very exciting and worth every step. We are an Autistic family, we are Different, but we are NOT less or greater than any other family. This is Our family’s path and we are AUTISM PROUD. Our path is blessed with the best guides we could ever ask for, our children. Our children will show us the way and they will teach us what is truly important in this world, because in their innocent, unconditional love lays the key to happiness. We show our Autistic Pride by letting the world see we embrace diversity and face a challenge with thankful and faithful hearts, because God blessed us with an Autistic Angel who colors our world with Au-Some rainbows and provides us with endless possibilities for an extraordinary journey and life. Happy June 18th, which is officially Autistic Pride Day; however Autistic Pride lives in our house and family EVERY day!